The 2019 women’s NCAA tournament bracket was supposed to be revealed at 7 p.m. ET Monday night on ESPN. But more than three hours before the scheduled selection show, there was a leak. The culprit? Had ESPNU on since I didn't see their bracket show last night. For a good 20 minutes they were revealing the entire women's tournament matchups on the bottom. Someone screwed up. 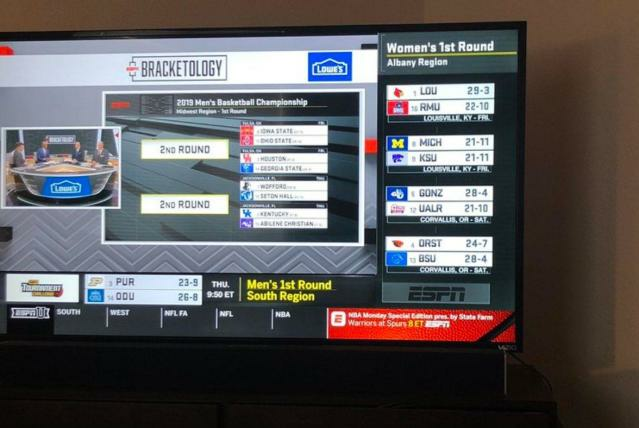 Video of the ESPN gaffe shows sections of the bracket rotating on the side of the screen every 10 or so seconds. Soon enough, social media users had pieced together the full bracket by hand. The leak, and subsequent adjustments, ruined the entire evening for all involved, in so many ways. Viewing parties were likely cancelled. There will be no raw emotion and tension captured on camera, no live reaction shots of bubble teams finding out they’ve received a bid. We’re good at keeping secrets (unlike some people 🧐), so our players will be genuinely surprised at 7 PM! But it clearly wasn’t the same. Putting aside the logistics of the leak and focusing on the bracket itself, there were two major newsworthy items: Tennessee is in, and UConn isn’t a No. 1. The Lady Vols were in danger of missing the NCAA tournament for the first time ... ever. They were one of several teams in contention for the final few at-large spots in the field. And they got one. UCF, Auburn and Indiana got the other three. Arkansas, Ohio and TCU were left out, and are NIT-bound. Meanwhile, Louisville and Mississippi State nabbed top seeds ahead of UConn. It’s the first time since 2006 that the Huskies haven’t claimed a No. 1. In the past, men’s NCAA tournament brackets have leaked on the internet before their reveal on CBS, despite the NCAA going to great lengths to prevent exactly that from happening. In 2010, a user on a Maryland fan message board had all the juicy bracket tidbits 45 minutes before CBS viewers did. In 2016, the entire bracket was all over Twitter midway through the (long) selection show. But, of course, those are different. This is ESPN rendering the selection show, to which is has rights, irrelevant. What a colossal error. So how did the leak happen? There are two stages of bracket security: One before the precious field of 64/68 is handed off to the NCAA’s broadcast partner, and one after the exchange. The NCAA goes to great lengths to protect the integrity of its process and ensure CBS has the exclusivity it desires, sequestering selection committee members as though they were jurors in a high-profile trial. Once they arrive in their rooms at the Conrad Hotel in Indianapolis on Wednesday afternoon, the 10 members of the selection committee don't leave the hotel's 18th floor until they've chosen the 68 teams who will make this year's NCAA tournament. A security guard stands watch at the elevator all hours of the day and night to keep curious visitors away. All meals come via room service and are served in a hotel meeting room. Committee members are discouraged from using their cellphones and calls to their room phones are sent directly into a messaging system. The only other people who have access to the 18th floor conference room where the selection committee assembles the bracket are a few hand-picked NCAA employees, a handful of hotel staffers and a CBS camera crew. Before the hotel staffers can restock the drinks and snacks or the CBS crew can come get footage, committee members shut off their monitors and turn the papers on their tables face down. CBS typically receives the bracket from an NCAA staffer about 30 minutes before the selection show airs, but its staff is just as careful to minimize the chance of leaks once it arrives. The email with the bracket is password-protected and only a limited number of on-air and behind-the-scenes employees have access. The process for the women’s NCAA tournament is clearly different. ESPN had the bracket at least four hours before the scheduled reveal. And somebody – perhaps multiple people – made a massive, massive mistake.